DUGABO at night, in today’s post. 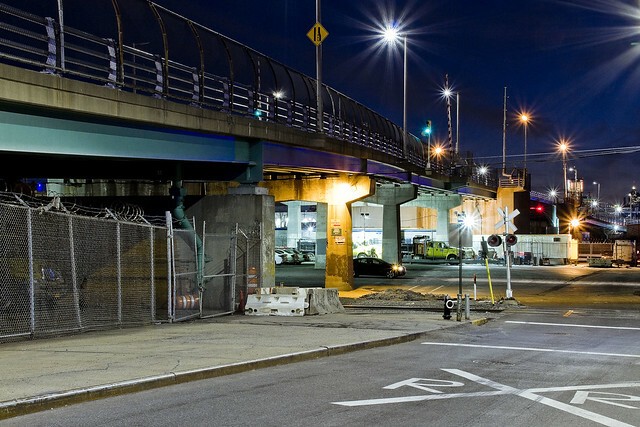 The reliable Greenpoint Avenue Bridge is a double bascule drawbridge which spans the Newtown Creek, connecting the Greenpoint section of Brooklyn with the Blissville section of Queens. Heavily travelled, there are two access roads alongside the bridge which lead down to the aptly named Railroad Avenue. This is the latest Greenpoint Avenue, or John J. Byrne memorial, Bridge. The 1900 vintage bridge which the modern version replaced was just to the west of the modern span, sat in the footprint of the access road in the shot above, and it carried railroad tracks. There have been five Greenpoint Avenue Bridges, this is the 1987 model which is a renovated version of GPA Bridge #4. It’s 1.37 miles up the creek from the East River, and opens a few times a day to allow tugboats and oil barges egress. The 1850’s original was called the Blissville Bridge, and it was made of wood. Railroad Avenue is the very definition of what I often refer to as “the concrete devastations of Western Queens.” Formerly, this area was remarkable for the presence of the Tidewater Pipeline company (a Standard Oil subsidiary) and the Buckeye Pipeline. In recent years, the Broadway Stages company has been buying up property along the bulkheads in pursuance of creating TV and movie filming locations. Their desire to maintain the “real” and “gritty” side of LIC for theatrical usage has accidentally turned the company into building preservationists. 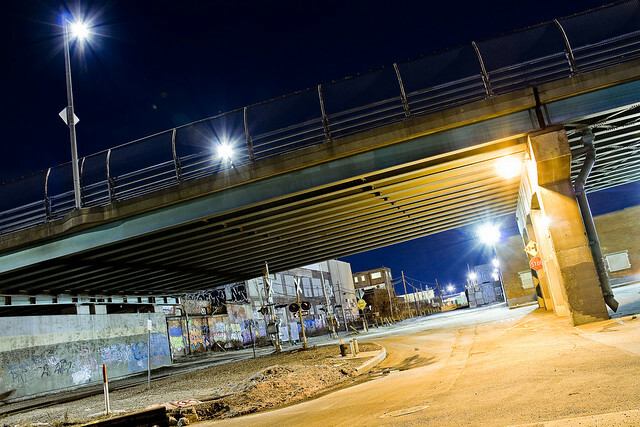 If the area looks familiar to you, you’ve likely seen it in some of the Marvel Netflix productions like “Punisher” or “Daredevil” that were filmed down here. Every cop show in NYC has done a scene hereabouts as well. If you follow Railroad Avenue to its western terminus, you encounter the Sims Metal recycling works. Sims has been mentioned too many times to count at this – your Newtown Pentacle – so I’d ask you to just type “Sims” into the search box at upper right of this page to check them out. Suffice to say that in addition to handling all sorts of scrap metal and junk cars, Sims Metal also enjoys a municipal contract with the City of New York which sees them handling the metal/glass/paper curbside recycling program (blue and clear bags) that the Department of Sanitation operates. If you were here during during the work week or in the daylight hours, on Railroad Avenue in Blissville, there would be dozens and dozens of heavy trucks and DSNY vehicles idling while waiting for their chance to tip out their collections at Sims. All of these trucks transit through Blissville, some come twice a day. The Blissville Yard of the Long Island Railroad is an MTA owned facility. Up until the 1990’s, there was regular passenger service along these tracks, which are known as the Lower Montauk. 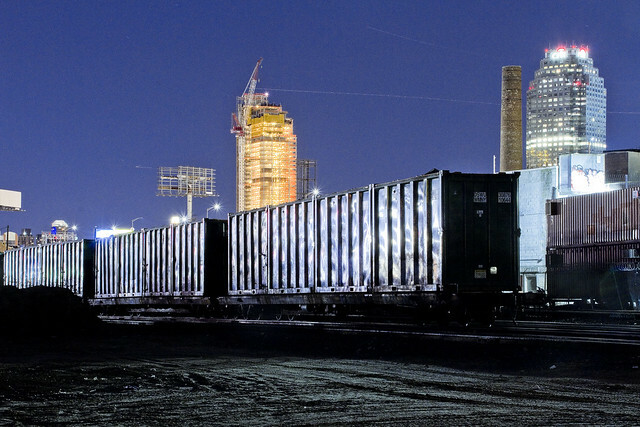 Today – the name of the game on the Lower Montauk is freight, and the Blissville Yard is used to build the up the linked box cars of the garbage train, six days a week. In tomorrow’s post, I’ll show you the other side of Railroad Avenue, where the black bag or putrescent garbage goes for processing, and loading, into these green box cars. As a note, the shots being presented in today’s post are all long exposures. Railroad Avenue literally has no street lights, and it’s only ambient glow from the industrial lots surrounding it illuminating things. Figuring that somebody would ask, in between the tripod shots I cracked out a handheld one that accurately depicted something closer to what the naked eye can see down here at night – this one. 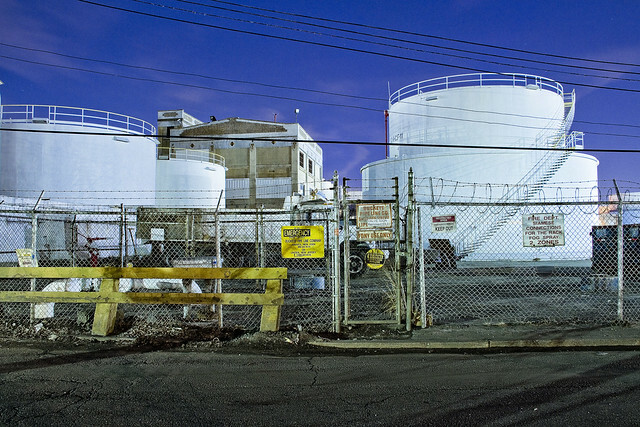 These oil tanks are now part of the Broadway Stages properties portfolio, but they were once known as the Lukoil/Getty dock. The signage on the fence indicates that the pipe you see in the lower left hand corner is a now inactive valve for the Buckeye Pipeline. 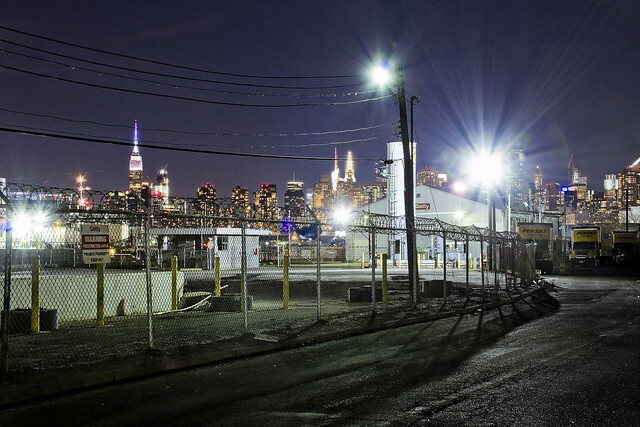 The building in the distance is the former Tidewater facility that juts up against the bulkheads of Newtown Creek. Getty is one of the family of oil companies (a subsidiary of Mobil, I believe) which were initially named in the 2010 Superfund decision by the EPA. More recently, Sims Metal and the Long Island Railroad have been added to the list of “potentially responsible parties.” The City of New York itself is one of the bad guys, too. 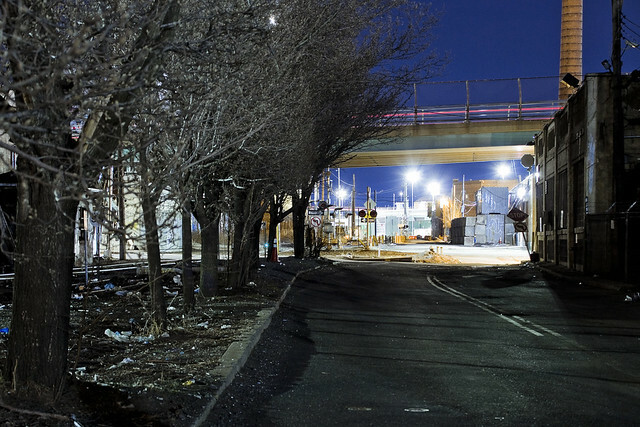 That’s the western side of Railroad Avenue, here in Blissville’s DUGABO (Down Under the Greenpoint Avenue Bridge Onramp), for you. Waste Transfer stations, fading oil infrastructure, movie and TV sets, no street lights or sidewalks. Tomorrow, I’ll show you the eastern side of DUGABO. Your first thought, just like the Mayor, must be that it would be ideal to site a gargantuan homeless shelter nearby, right? What could go wrong with that idea? At this point you should probably be collecting some kind of advertising revenue for SIMs.